Um, I’m pretty sure no one. You know why? Because food on a stick is fun! It makes you feel like a kid again! These Mediterranean Antipasto Skewers that I created for my Oscar party are my grown-up equivalent to corn dogs at the county fair. Could these ingredients have just as easily been tossed into a bowl and called a “pasta salad”? Yes. But where’s the fun in that?! Skewers are much more fun than forks. Save your forks for the Grammys. This is the Oscars, people. 1. Cook tortellini according to package directions. Drain, and rinse in cold water. 2. Place tortellini, pepperoni, artichoke hearts, hearts of palm, cherry tomatoes, and mozzarella in a large bowl. 3. Whisk together olive oil, balsamic vinegar, white vinegar, Italian seasoning, salt and pepper in small bowl, and pour over antipasto ingredients in large bowl. Gently stir to combine, and refrigerate to chill at least 2 hours before serving (I chilled mine overnight, gently stirring occasionally). 4. 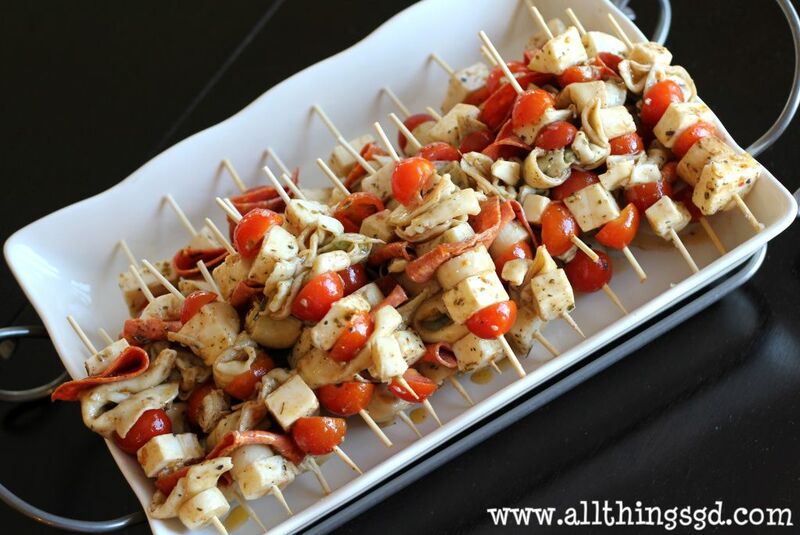 Thread ingredients onto skewers, place on a platter, and enjoy! Check back tomorrow for pictures from my 2012 Oscar Party, including photos from our red carpet! What a fantastic idea! I love this and will definitely be trying it! Ok, those look wildly good. Yum! Might make these for my office party in a couple of weeks. Thanks for sharing! Yum! What a great twist on a pasta salad! I will SO be making these. YUMMO!!! Thanks everyone! 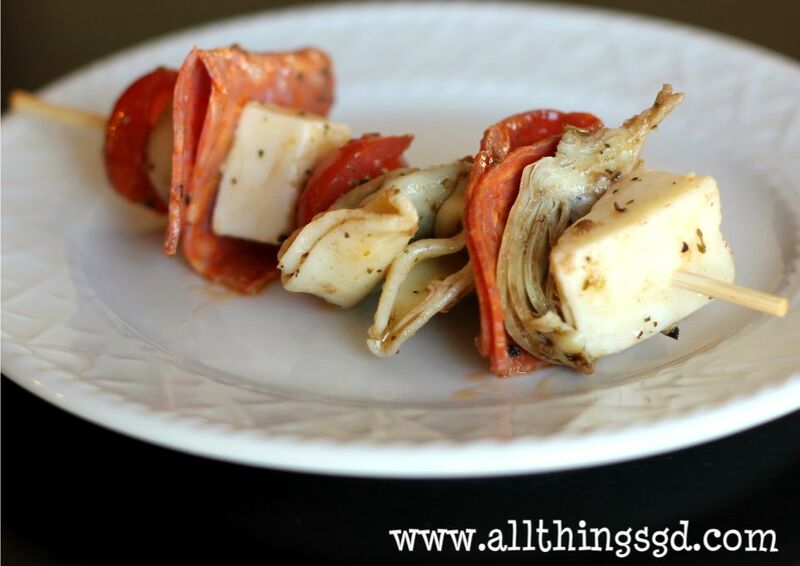 These were so delicious–think I might have to make them again this weekend!